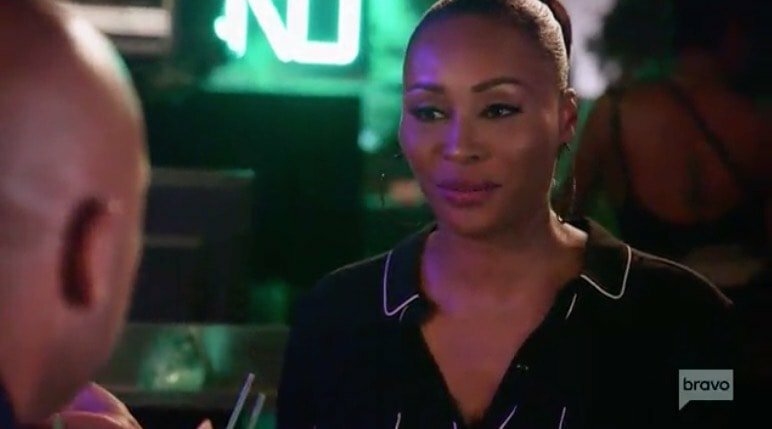 So far this has been a pretty enjoyable season of Real Housewives of Atlanta for Cynthia Bailey. She threw a Cynthia-themed birthday party for herself and she has been going on dates with her new man Will – and the chemistry is undeniable between the two of them. There’s been zero drama for Cynthia other than what she’s witnessed from the other ladies. Seeing the back and forth between Kenya Moore and Kim Zolciak in person without the bleeps censoring the curse words had to be unreal entertainment. Or at least that’s how I would have felt if I was there. Cynthia talked about the last episode in her Bravo blog which included that perfect frozen yogurt date she had with Will. Well it WAS perfect until he brought up the blogs drawing attention to his “relationship” with Cynthia even though they were only on date two. Then again, he was dating her in front of reality TV cameras, so he couldn’t have expected it to remain “private” for long. She continued, “Two days later, it was a hot topic on The Wendy Williams Show and all over the blogs. I was like, ‘Wait, we just met!’ I wasn’t ready to go public, so we were both caught off guard.” Oh, well. Will seems super into Cynthia so she probably doesn’t have anything to worry about. Getting to the major drama of the episode, Cynthia admitted, “I was trying to figure out Kim’s issue with Kenya.” The “issue” is most likely rooted in securing a story line. Cynthia said, “I know they had words at Sheree’s [Whitfield] housewarming party because Kenya (and Kandi) went into Sheree’s unfinished basement. However, that was a while ago, and Kenya and Sheree have moved on since then and are cool now. I was very confused.” Again, it is most likely rooted in securing a story line. From that point on, insults were exchanged, the shade got darker, and no one truly knows what they’re fighting about. TELL US – DOES WILL SEEM LIKE A GOOD MATCH FOR CYNTHIA? WHOSE SIDE ARE YOU ON: KENYA’S OR KIM’S?